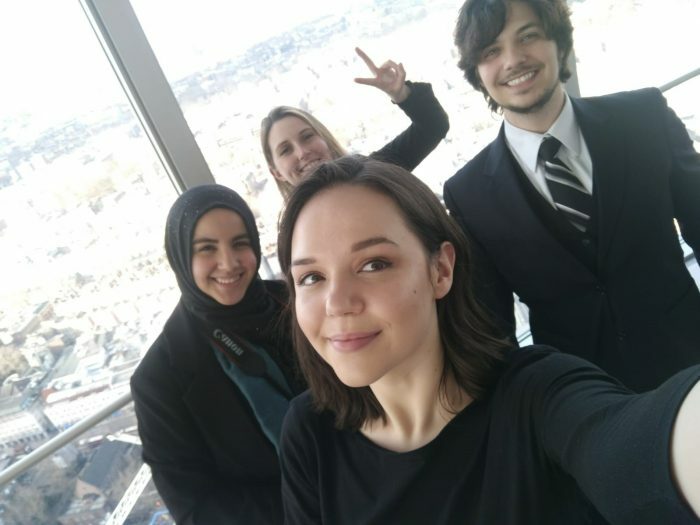 The following is a student blog report from Team Encryptonite: Shahed Warreth, Felipe Simoni, Andrea García Rodríguez and Laura Bartley. 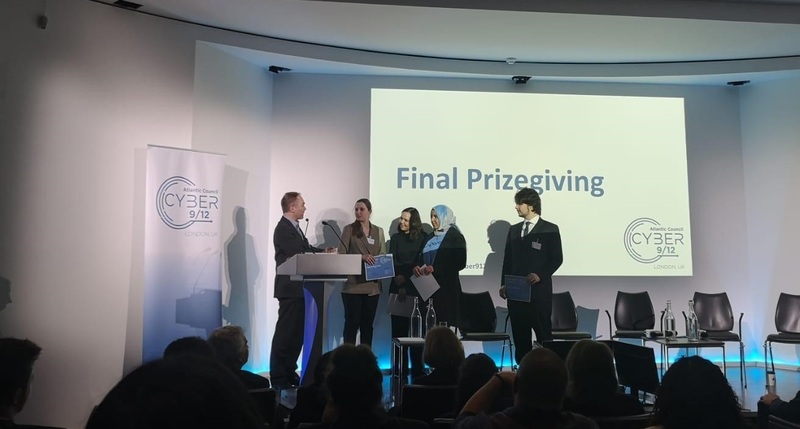 The students came third in the annual Atlantic Council Cyber 9/12 Strategy Challenge, which took place at the BT Tower in London, February 2019. “The Cyber 9/12 Strategy Challenge is a policy and strategy competition designed to identify future cyber-strategists from a non-technical background. Organised by the Atlantic Council, the prestigious think tank from the United States, it is celebrated in various locations around the globe. Teams are made up of four participants and are encouraged to be diverse. The assessment of a fictitious scenario and the crafting of a strategy and concrete policy measures is the goal of the Challenge. Outstanding professionals were invited to judge our performance in the challenge, assessing our work based on their vast experience with practical intelligence in big companies in the private sector, military institutions and diplomatic bodies from the UK and US, academic research including some IT aspects of the crisis. We received the material of the scenario during Christmas break, i.e. a month and a half before the competition took place. In it, an independent researcher found a vulnerability in software that managed mainly UK oil flows—albeit it also affected foreign facilities—and threatened to go public within a month should the bug not be patched on time. During the months prior to the competition, we tried to familiarise ourselves with UK institutions, main Acts and protocols of procedure regarding an attack on critical national infrastructure (CNI). However, coming from an international relations background and being the four of us non-UK nationals added some extra difficulty. Nevertheless, our diversity played a central role in our success in the competition. During the second round, semifinals, we received an update on the initial scenario. The intelligence files we received made us think of a bigger plot. If we had more than a month to prepare for the first round, we had now to work overnight. Deadline for submission was at 6 am in the morning. The intense work schedule got us free RedBull the day after for being the team that had worked the longest hours, relevant enough that could not go unmentioned by many of the professional how recurring these situations are in the exercise of their professions. Team Encryptonite got to the finals and we were positively surprised that our hard work had been profitable. This time, the urgency of the situation only allowed participants to have 20 minutes for preparation before briefing the audience on new findings and pathways to minimise damage and restore control of the situation.